Darina loves French food. Well duh... Her blog is Gratinee after all. So when I bumped into her at the Sen Bistro media tasting event, we decided that it was time to do a French food adventure. Seeing how Whipping Girl loves French food like Miley Cyrus loves a buzz cut, we invited her as well. 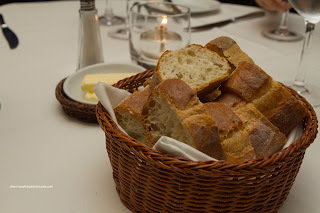 We originally targeted La Cigale as our destination, but ended up changing it to Boneta. But that was not good enough for Whipping Girl as her favourite dish - Moules et Frites - was not on the menu. She threw a temper-tantrum that would make Sue Sylvester look tame, threatening to cancel on us. Fine. We eventually settled on Bistro Pastis because not only did it have Moules et Frites on the menu, it was convenient for Choobee to join us as well. While we were looking for a parking spot, Whipping Girl texted us indicating that she felt rather young amongst the clientele. Hey, I don't blame her, as our table probably brought the average age down 25 years. 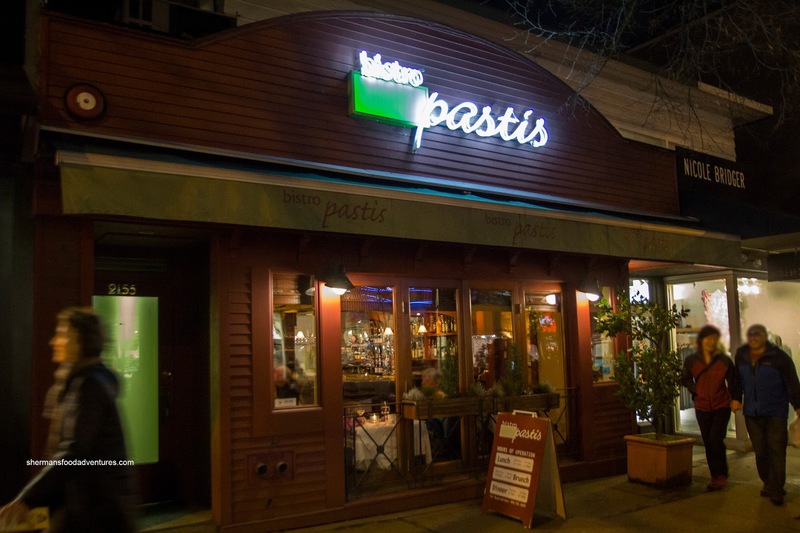 Yes, Bistro Pastis is a traditional French restaurant. We had no problem with that as we heard their food is quite good. 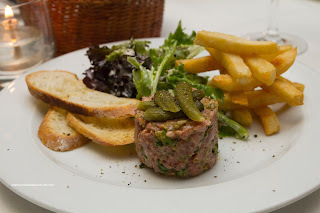 I ended up starting my meal with Le Tartare et Frites (Steak Tartare & Fries $16.00). Topped with cornichons, the steak tartar was tender with a nice crunch from the pickles. I found the flavours to be balanced possibly wanting a touch more spice. Although it did not ruin my eating experience, there was one piece of gristle I had to pick out of the tartare. On the other hand, the frites were really good being crispy and light. 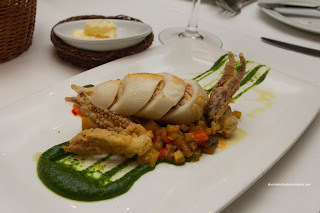 Choobee opted for Les Calamares Farcis (Calamari $12.50) stuffed with crab and chorizo accompanied by ratatouille and parsley puree. The whole squid was soft while the tentacles were fried. The filling was quite mild despite the use of chorizo. This was a good thing as it didn't overwhelm the crab. I also liked the ratatouille as there were clear flavours rather than being muddled. Choobee brought along a friend as well and hey, I wasn't complaining as there was more food to try! She had the featured appie of the day being the Chicken Liver Pate ($15.00) served with onion jam and brioche. 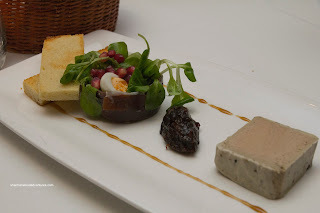 I found the pate to be super smooth and relatively light. It was sweet with a hint of cognac. The onion jam was sticky and sweet which was naturally a nice compliment to the pate. 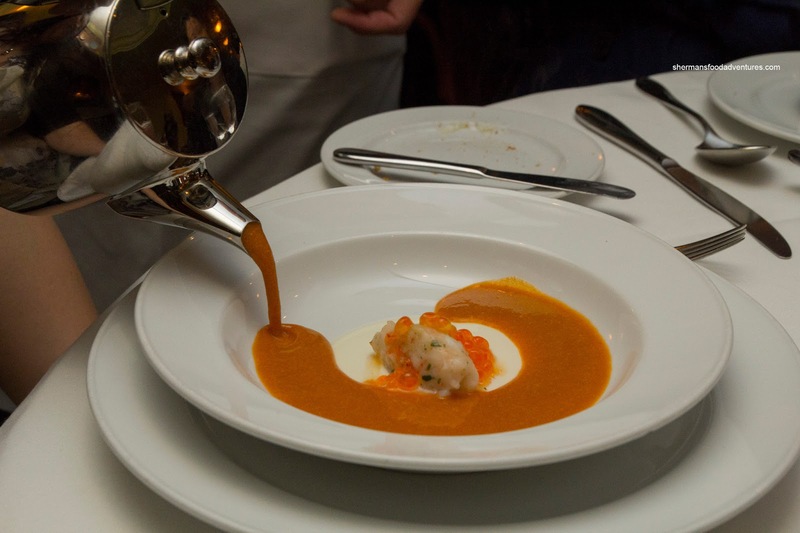 Whipping Girl decided on La Bisque de Homard (Lobster Bisque $12.50) which was poured table side. At the centre of the bowl rested a prawn quenelle and salmon caviar. The bisque was creamy and rich with a strong lobster essence. I liked how it wasn't too heavy on the salt, rather the true flavours were highlighted. 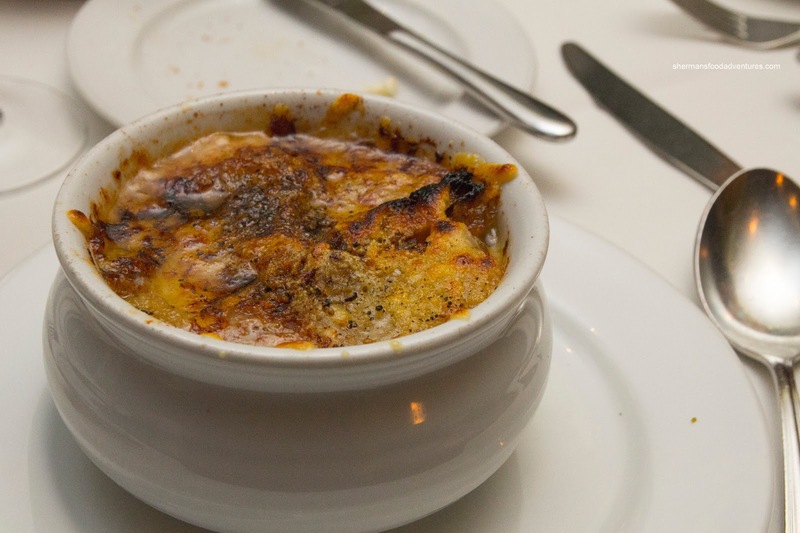 Darina had the classic La Soupe a L'Oignon (French Onion Soup $9.50), where she helped me take the picture, so credit goes to her! I got to take a couple of spoonfuls of the soup and the first one made me think it was too salty. On a subsequent scoop with all of the components (the crouton and cheese), it was more balanced with salty, sweet and cheesiness. 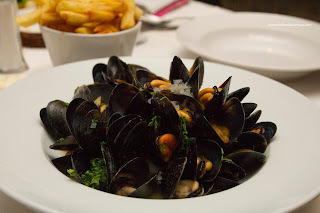 And here it is, the dish that caused all the commotion - Moules et Frites (Mussels & Fries $24.00). This was the entree version which was served with fries. Otherwise, the appetizer portion would be served without. The mussels were prepared with a classic white wine and shallot broth which could've been cooked down a touch more as there was a noticeable alcohol taste. However, it didn't break the dish as the mussels were cooked nicely. They were plump and sweet. 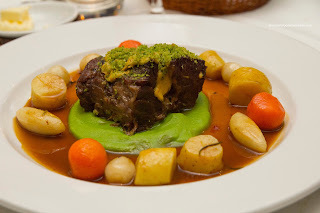 For my main, I had the Navarin D'agneau Printanier (Braised Lamb $28.00) with herb crust, sweet pea puree, fingerling potatoes, root vegetables and tarragon jus. The lamb was practically melt-in-my-mouth moist. The meat was fatty, rich and "lambtastic". There was a rich red wine essence to the silky jus. I really enjoyed the herb crust as it added a nice textural contrast to the soft lamb as well as added flavour. To top it all off (or bottom in this case), the sweet pea puree afforded a certain mellow sweetness to the dish. 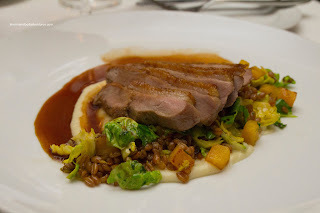 Choobee went for Le Cunard et le Porto (Brome Lake Duck Breast $29.00) with sunchoke puree, warm golden beet & farro salad with port wine sauce. This was a fairly large duck breast which was tender despite being cooked mostly through. We found the duck skin to be slightly chewy, in need of some crispiness. Underneath, the farro provided body to the tender beats. The port wine sauce was silky and balanced. 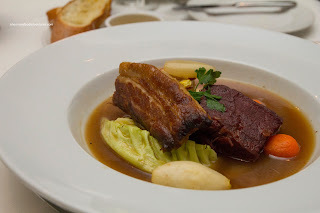 The last dish at the table was Le Pastis Pot au Feu (Braised Beef Shoulder $27.00) with a thick slab of bacon, roasted marrow, turnip and carrot with garlic croutons on the side. I was able to sample the meats and they were fork tender where their natural flavours shone. 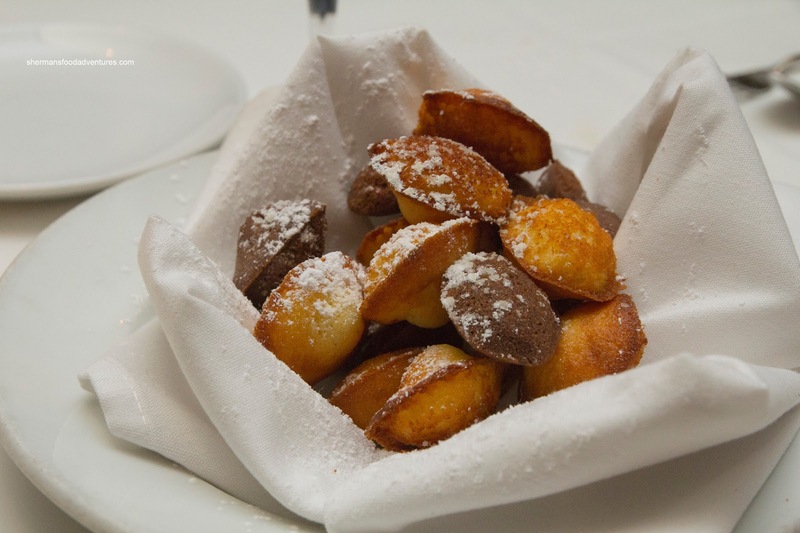 A simple, yet impactful dish. 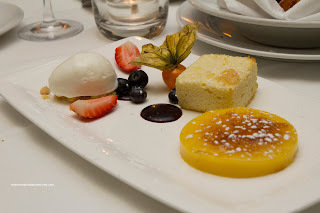 For dessert, we shared 3 items starting with the Lemon Trio ($10.50) consisting of brulee lemon curd, chiffon cake and sorbet. I found the lemon curd to be too sweet and even the tartness at the end didn't seem to help. The chiffon cake was fluffy while the sorbet was a nice balance of sweet and tart. 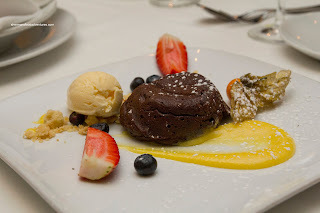 Next was the Molten Chocolate Cake ($10.50) with passion fruit cream and marscapone ice cream. The cake itself was fluffy on the inside while being semi-sweet. I particularly liked the crunchy crumble on the plate. Lastly, we had the Madeleines ($9.00) which were warm, soft and great for sharing. Overall, we thought that Bistro Pastis would rate a solid 4 out of 5 if we had to use numbers. Basically, it is a classic French Bistro that produces good food with attentive service. I enjoyed the meal. Pretty classic French, for sure. I'd go back.